Do you have a favourite heritage site in your neighbourhood? Is there a building of interest in Calgary that you would hate to see demolished? You can make a difference by “adopting” an at-risk heritage site for the next year, or for as long as you want to be involved. Choose an at-risk heritage site – Choose the sites on CHI’s Heritage Watch list or another site that interests you. If a particular site is of interest to several people, it will be assigned by lottery. See view CHI’s Fact Sheets on our Heritage Watch Page for the properties listed in the first column. Monitor the activity on the site – Monitoring can include background research, checking for development permits, media stories, drive-bys, photographs, etc. CHI will give you ideas, support and training about how to monitor your site. Let CHI know about what is happening – Attend Heritage Watch meetings or send emails to CHI to update us on what is happening with your site. Interested? Email us at contact@calgaryheritage.org with your questions and sites of interest. Put “Adopt-A-Site” in the subject box. At the time of Canada's Confederation in 1867, Calgary was experiencing the western immigration boom. When the Canadian Pacific Railway reached Calgary in the 1880’s, development really started to take off. By the country's centennial year in 1967, the Calgary Tower was under construction along these same tracks. Unlike Canada’s eastern cities, Calgary’s built heritage may not reach back to confederation, but there are plenty of stories yet to be told about the buildings, homes, industries, and people that followed the boom-bust cycles of our development. Inspired by the National Trust for Canada’s goal for the nation's 150 years of Confederation, celebrated in 2017, the Calgary Heritage Initiative initiated plans to “broaden our circle of supporters and public champions". CHI is reaching this goal through Your Stories, a multi-year program of engagement, education, discovery, and storytelling about our built heritage. The frontier years, railway era and early settlement, up to 1905. The age of optimism before the First World War. The oil boom of the mid-century and the post-war influences on the City’s development. Workshops on community engagement, how to research historic properties, demystifying the historic resource designation process, and renovating heritage properties. Seminar series on creative writing, photography, videography, how to conduct oral histories, how to lead neighbourhood walks, how and where to post stories. Talks and tours that share the stories about Calgary’s built heritage. CHI wants to share your stories! We are seeking short, 400-500 word illustrated articles for our web posts/archive and social media. Inspire others to be as passionate about preserving heritage as you are. Visit our "Posts" page for examples and email contact@calgaryheritage.org with “Your Stories” in the subject line if you have questions or want to submit. Stay connected with CHI’s events and posted stories– join CHI today and sign up for our emails. Need Help with How to Tell Your Heritage Story? 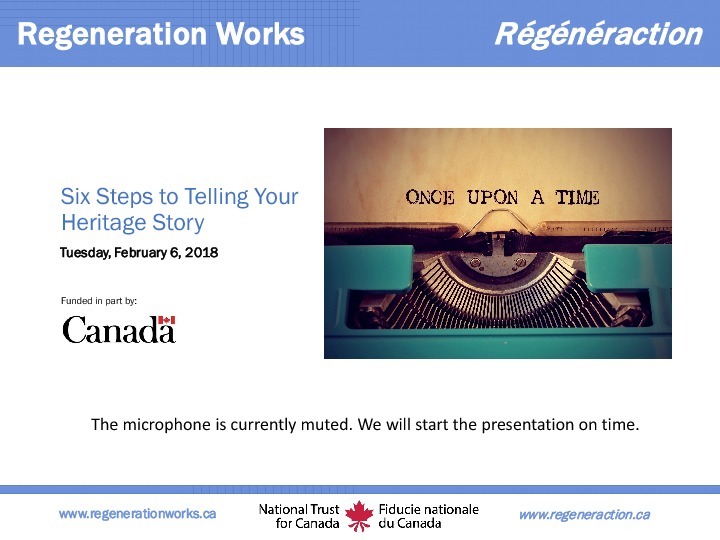 Check out the slides and video from Regeneration Works/National Trust for Canada’s February 2018 Webinar. • Use stories to engage, inspire and compel. • Your story tellers are in your organization and in your community. • Tailor stories to your audiences. • Photos and videos bring your story to life. • Social media is a great way to tell and spread your story.